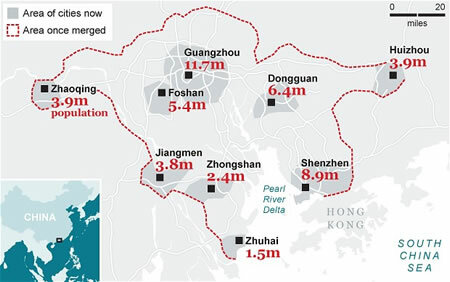 China plans to merge the nine cities in the Pearl River Delta into one colossal megacity that will be the largest metropolis in the world. The "Turn The Pearl River Delta Into One" project will create a 16,000 square mile urban area that will pull together ten percent of China's economy. "The idea is that when the cities are integrated, the residents can travel around freely and use the health care and other facilities in the different areas," said Ma Xiangming, the chief planner at the Guangdong Rural and Urban Planning Institute and a senior consultant on the project. Sprawling megacities are familiar ground for sf fans. Science fiction writers have created (mostly) dystopian stories about enormous cities; for example, The Sprawl or the Boston-Atlanta Metropolitan Axis (BAMA) from William Gibson's work and Mega-City One from the Judge Dredd comic. Trantor... could scarcely avoid being the densest and richest clot of humanity the Race had ever seen. Readers can no doubt think of other examples.